After the warmest night we had experienced since early August in California, we were moving with sunrise. 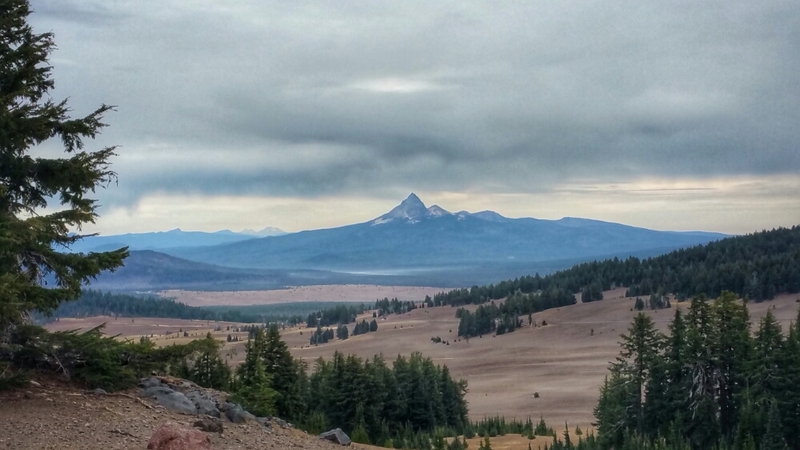 I was excited since we were within a short walk of my favorite mountain in Oregon – Mount Thielsen. We’ve always appreciated it from afar, where its distinctive profile makes it obvious from all directions. But we would be traversing its lower flanks, giving a different view. 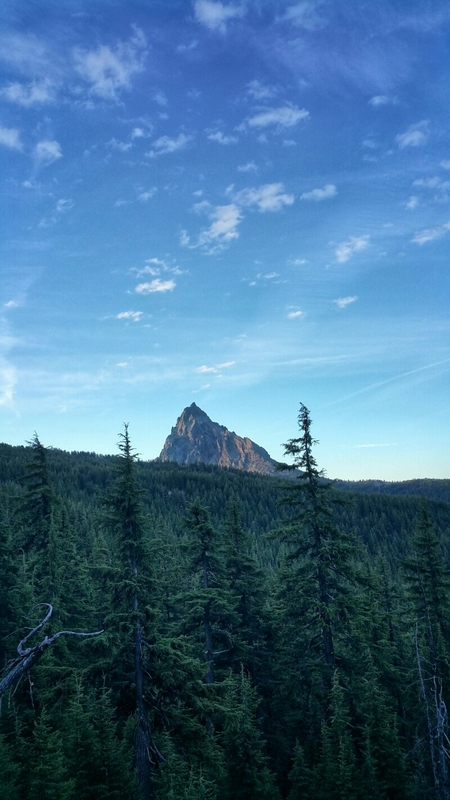 Since it’s difficult from this angle to really appreciate the unique shape of “The Lightning Rod of the Cascades“, here’s a link to an image I took of the mountain last year. Traversing the Mount Thielsen Wilderness, we were in trees most of the day, thankfully. We were now in the midst of the longest water carry in Oregon, a full marathon between the ice cold flow of Thielsen Creek on the northwest flank of Mount Thielsen to the Rim Village on the southern rim of Crater Lake. Not only would we need to carry the water for the distance, but also enough for dinner and breakfast since we wouldn’t make the distance in one day. But we did get a view of our target of Mount Mazama, the remains of which are now Crater Lake. 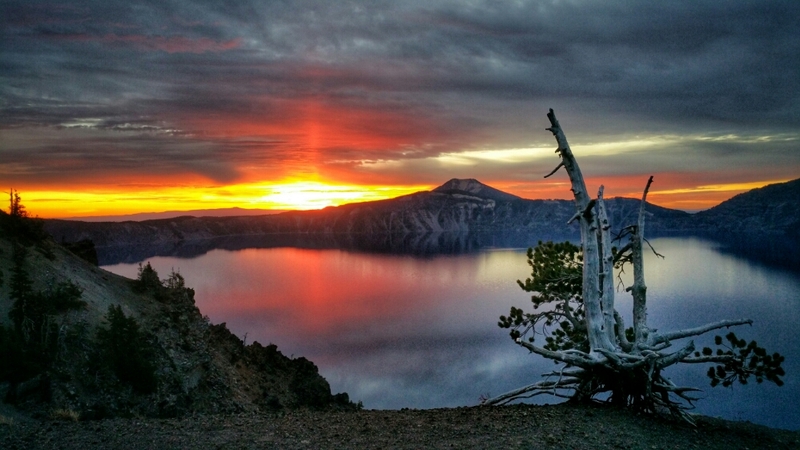 It doesn’t look like much from here, which is one of the things I like most about Crater Lake. You don’t think much is special until you get right to the edge, then the full beauty is revealed as a complete shock. From left to right are the individual mountains around the rim – Mount Scott, which is set back from the rim about a mile; several lesser peaks; the smooth hump of Llao Peak, a deep volcanic flow from the ancient volcano; and Hillman Peak, the highest point on the rim. 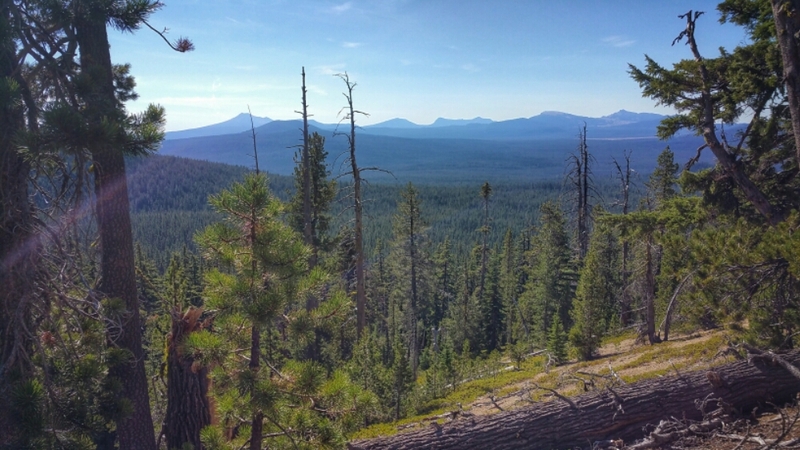 The remainder of the day was in forest as we crossed Diamond Lake Highway, transitioning from Mount Thielsen Wilderness to Crater Lake National Park. That transition also marked the slow climb to the rim of the lake. 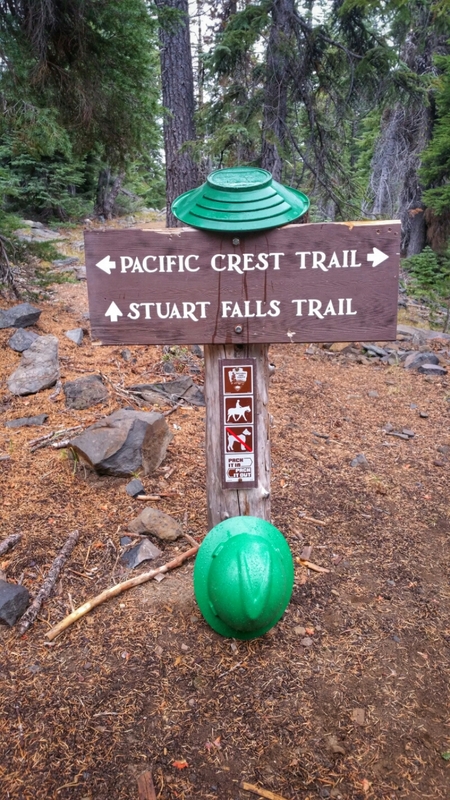 Since the PCT is on the east side of the North Entrance road into the park, we saw no evidence of the large wildfire that burned the northwest corner of the park earlier this summer. The firecrews did a fantastic job of using the road as a fire break. Since the park has very strict rules of where camping is allowed, we stopped short of the rim about three miles and camped. A 4am alarm and a 3-mile hike in the dark put us in place at is one of my top 3 places in the world to stand and just be. 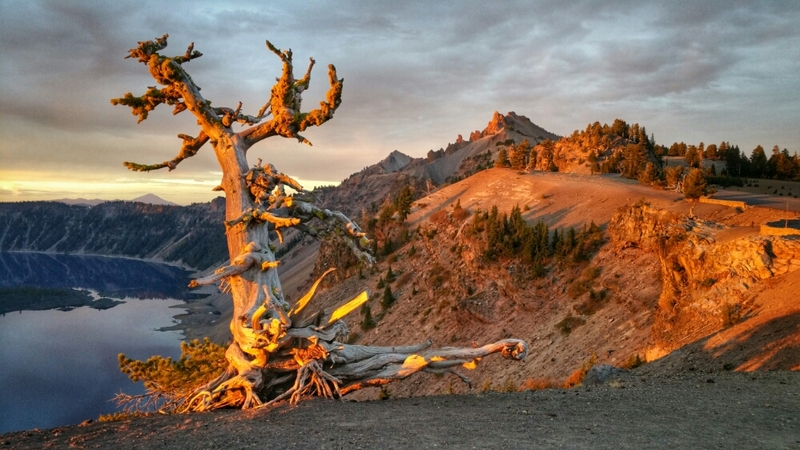 Ancient caldera, ancient Bristlecone and a sunrise. Just us, brewing and sipping coffee and getting lost in the moment. A few moments later and a turn to the right (south) and we can see the new sunlight kiss another ancient Bristlecone and Hillman Peak, while Mount McLoughlin (our next PCT destination) and a distant Mount Shasta lurk in the distance. A quick turn in the opposite direction, looking to the north, we can see South and Middle Sisters, where we hiked a week before. 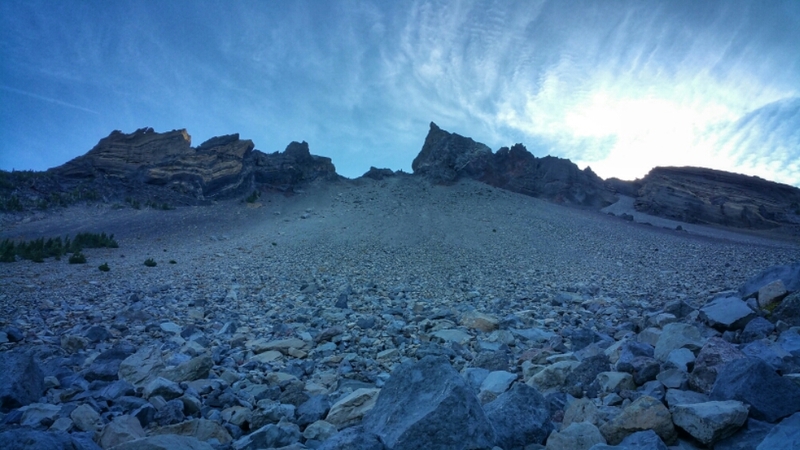 But it would take a short hike around the Rim Trail before we could catch a glimpse of the fabulous profile of Mount Thielsen. The rest of the rim trail continued to give great views of the lake, many that were completely new to us, even after many prior visits to the park. That knowledge came in handy, as at each of the turnouts we were asked for suggestions on views or hikes around the lake. We joked that I must have had a bubble floating over my head like a clue-giver in a video game. 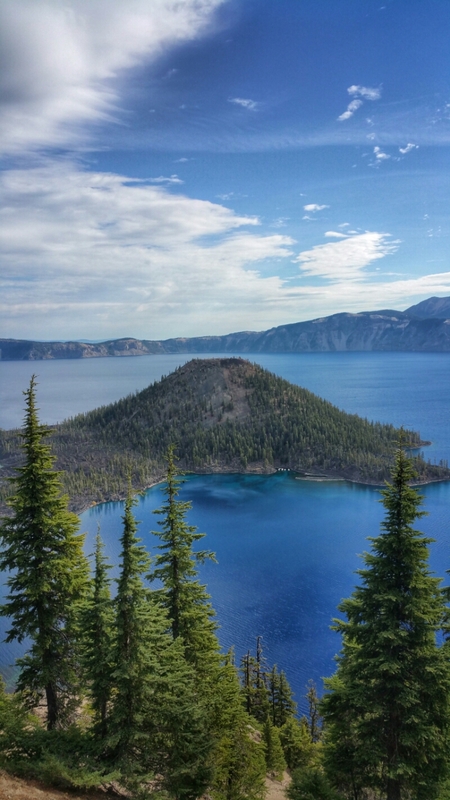 Between laughs, the clouds broke enough to give us a glimpse of the signature blue water of Crater Lake. Had we continued our hike in linear fashion, we would have come through in late August and wouldn’t have been able to see much due to smoke from the fires. Soon we reached the Rim Village, where we relaxed, ate some fresh hot food, and then headed off the mountain to meet a friend who would deliver our food that we would need for our final push to Ashland. A great visit, some tasty town food, laughs and connection with two southbound hikers with whom we had leapfrogged over the previous few days, then an after dark push a couple of miles down the trail so that we would get into the allowable backcountry camping zone marked the end of a long (but short mileage) day. An early morning with a tent soaking of condensation, we moved quickly and waited a couple of miles before breakfast. Soon after that – rain. The likes of which we hadn’t experienced since Washington. Rain heavy enough that we were back to clearing and creating drains to get water off the trail. It was another long water carry, but we had plenty falling and streaming around us. We moved from Crater Lake National Park into the Sky Lakes Wilderness. Sky Lakes is an area where I’ve wanted to explore for a couple of years. Two years ago I didn’t know enough of the area before the end of the hiking seadon, last year it was closed due to a wildfire. 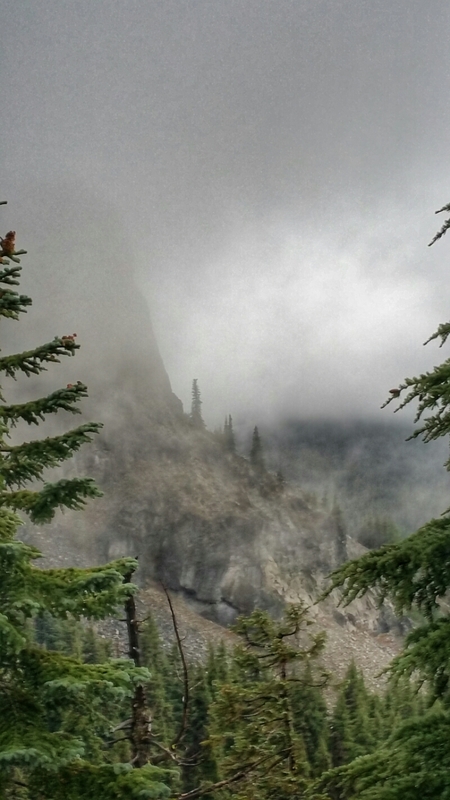 This year we wouldn’t see much due to our hiking a ridgeline in the clouds. But some views kept us entertained. The placement of the gold pan led me to sign a popular ’80’s song, which promptly got stuck in Jen’s head. She cursed me for that while I giggled. I’m a big enough fan of the group to know other songs to keep me entertained. She was stuck for a while. A hope of clearing was short-lived, but at least the rain tapered off before sunset. A late day, a scramble to find a suitable campsite, failing at first then squeezing between two burnt-out stumps remaining from last year’s fire, then a late-night fresh rain shower meant we were in for a long, wet, not entirely comfortable night. Another great post! Would you mind if I featured the photo of the cactus tree overlooking the water shed for a blog post? Love that picture!